Remember last season, when Russell Westbrook was an incredible monster, and his clutch performance was the stuff of legend? Remember how the Thunder outperformed their point differential by dominating those clutch situations? Remember how they went a shocking 26-16 in games that were within five points in the last five minutes? Well, yeah, that’s all gone now. In fact, after Friday night’s loss to the Detroit Pistons, the Thunder are 1-9 this season in games that were within five points in the last five minutes. No team in the NBA has been worse in those situations, and I feel, here, that I should remind you that this is a group that includes the Atlanta Hawks, the Chicago Bulls, and the Sacramento Kings. Westbrook has always been a serial freelancer in those situations, taking the set play and tweaking it to his own liking. Billy Donovan’s play was to hit George on a curl, or Westbrook in the middle of the floor with options. At that point, Donovan passes the baton to Westbrook to decide what happens. So if you’re thinking “what kind of play was that?” it’s apparently the one Donovan drew up. “It was exactly what we wanted,” Donovan said. The result of the play, in this instance, was a closely contested pull-up three from above the break, a low percentage shot under all circumstances, and a particularly galling one when you consider that OKC’s best non-Westbrook options are no longer guys like Victor Oladipo and Steven Adams. My sense is, Paul George catching off of a curl is virtually always going to yield a more efficient shot than the one Westbrook took, even given Westbrook’s freakish late-game performance from a season ago. George isn’t having an especially excellent season, but his efficiency (56 percent True Shooting on 26 percent usage) absolutely dwarfs Westbrook’s (49 percent True Shooting on 32 percent usage), in no small part because George is adept at working off the ball against a defense coiled to respond to the slightest twitch from the reigning MVP. But the question I’m interested in is less should Russell Westbrook be taking that shot, and more what happens to the Thunder if Russell Westbrook isn’t making those shots: last season, according to Nylon Calculus, OKC’s 47 wins were four better than their Pythagorean Wins, the second-largest positive discrepancy behind Boston’s plus-five. By this measurement, the Thunder were a 43-win team—just a couple games better than .500—that won more than 61 percent of clutch games. That’s an enormous, unsustainable jump, certainly not the kind of thing they can expect to replicate for a second consecutive year. With their dismal clutch performance so far in 2017, the Thunder sit at 8-10 overall, undeniably one of the bigger disappointments of the early season. 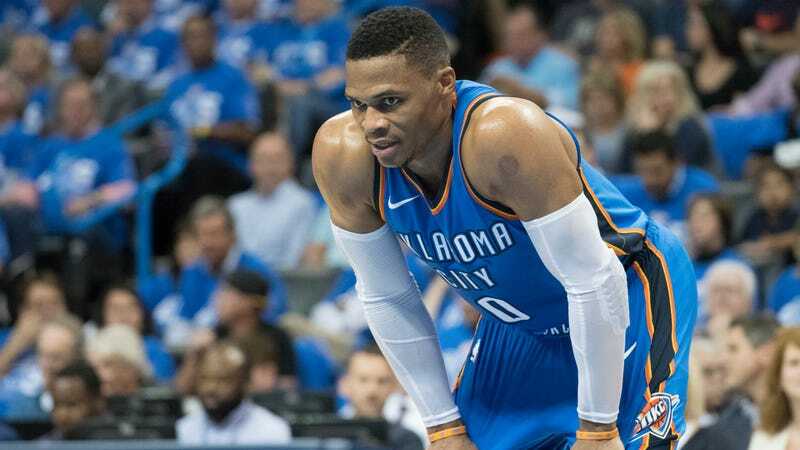 It’s a worrying spot for a team with as much star power as OKC, and an important puzzle they’ll have to solve in order to get their season on track. Their performance in clutch situations this season also demands some regression—they’re too talented to win just 10 percent of clutch games—but Billy Donovan might need to tighten his grip on those last second possessions. Whatever clutch magic powered Russ through his MVP campaign last season seems not to have survived the summer.